Take me home, down country roads. | Oh Look! It's A Blog! Hive is releasing new tractors at the event and they are amaaaaaazing! set a: cream + brick + brick mix ( I am using the brick in my photos). The barn shown will be at the event as well from Bazar. It’s perfect for those who have always wanted to live in a barn as it’s pretty modernized. The little shed I stuck my horses in and the table with food will also be available at 6Republic starting tomorrow, as well as the majority of the bushes and grasses shown around the scene. 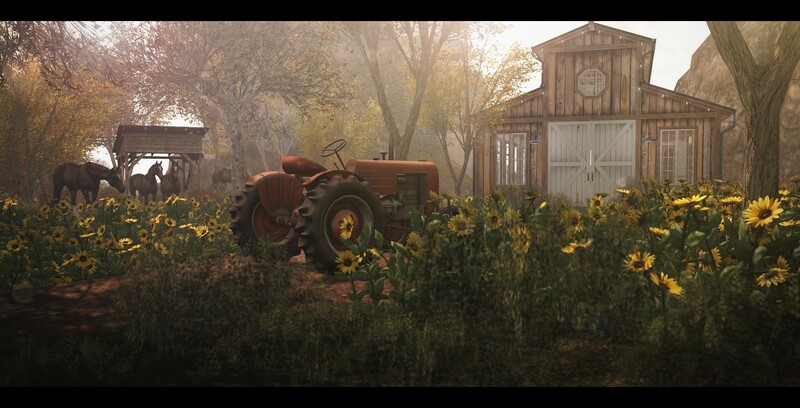 This entry was posted in iheartslFeed, Uncategorized and tagged 6 Republic, 6Republic, ACORN, Anhelo, Barn, BAZAR, BBQ, blog, Decor, Farm, Hive, Home, Second Life, SL, Tractor. Bookmark the permalink. They are pretty high prim, I think 14LI for just one small section, so just wanted to warn you about that.